We didn’t do much crafting or artsy projects over Christmas break because it was just too crazy. So, I guess I’m trying to make up for it. Here are some winter crafts to keep the cabin fever at bay if you’re stuck inside or to pretend like it’s freezing and frosty outside (if you’re in TX like me!). We used oil pastels to draw our snowman scene and then the kids glued mini marshmallows on the outline for 3D snowmen. 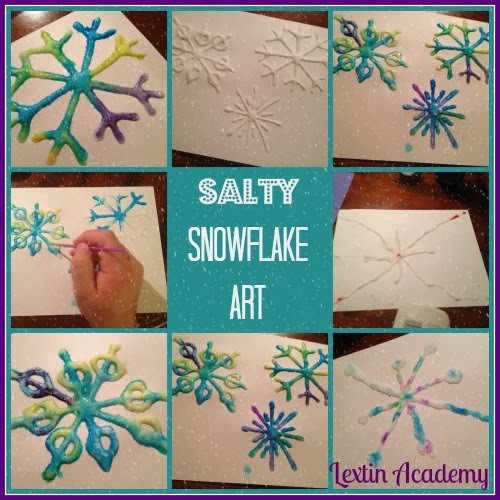 We drew snowflakes with glue and then sprinkled them with salt, shaking off the excess. Then while the glue was still wet we touched different parts of the snowflake with a paintbrush filled with watercolor paint. The paint spread through the snowflake to create tie-dyed snowflake art. The kids drew their snow scenes on white paper with white oil pastel. Then they used blue and purple watercolors to paint their snowy scene. The pastel drawing magically appeared through their watercolor painting. The kids created a cute snow scene by cutting out construction paper shapes and then adding details. Then we put our snow globe into a jelly roll pan and dropped paint covered marbles into it and let them roll around, creating a snowy scene. We painted one plate with various shades of blue and then sprinkled glitter. I cut the center out of another plate and the kids painted the edges. Once our plates were dry we added our snowman and tree. The kids used oil pastels to decorate. Then I cut page protectors to cover the hole in the cut-out plate. I taped the cut plate over the background to create our snow globes.